We are excited to announce the release of our new Efofex Cloud products! After a very successful beta process, we have even managed to get them out of the door a little early. Either nothing or everything, depending on your point of view. All of our six products (FX Draw, FX Equation, FX Graph, FX Stat, FX Chem and FX ChemStruct) have all had minor upgrades and improvements but the real changes are under the surface. Those changes will affect different people in different ways. I Want to Keep Using Efofex on Word for Windows, Just Like I Always Have! No problem. From your point of view the changes are minimal. You can keep using things in exactly the same way you always have. There have been almost no changes to how the products operate for you, but there still have been some improvements that will make your life (and the lives of those you collaborate with) easier. Any new graphics you create can be opened by someone on a Mac computer without any extra work from you. The registration system has been upgraded so the old process of entering a new unlock code every year goes away. The Help system has been moved online which means that you will have access to more up-to-date information. I Have Been Using Efofex on a Mac. Is Efofex Cloud Better? An unequivocal YES! If you have been using Connections, you will find the process a bit similar but without the downsides. The best thing is that you can now put your graphics anywhere but still edit them later and you no longer have to keep track of a separate data file. I Want To Use Efofex Graphics in Google Docs (or Pages, Keynote, OneNote, PowerPoint, Seqta, Moodle…) Can I? Yes. Just as easily as anywhere else. Two things. 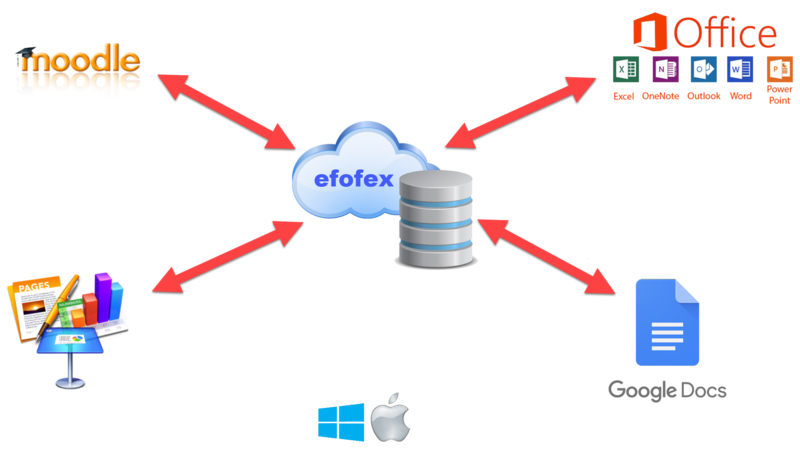 Efofex graphics programs now store their data in a central database that is backed up into the cloud. They also place an invisible ID into every graphic they produce which allows them to find the graphic’s data later on. To edit a graphic, you place it onto the clipboard and change to the Efofex product. It will find the ID and load the appropriate data, either from your local database or from the cloud. This means that you can place graphics anywhere, on any computer, and edit them later. Right now. Go to our downloads page and download the latest FX MathPack or FX SciencePack. If you are a current subscriber, you can start using the new versions straight away. If you hold perpetual licenses, there is more information on our Prices and Ordering page on what you can do. I Have Been Told That We Are Moving To Google Docs. Can This Help? Yes! Moving Efofex Cloud graphics to Google Docs is trivial.